Libertarian support for federal regulation of dog walkers? Regulation of providers of local services–barbers, real estate brokers, taxi cabs, etc.–is traditionally a function of state and local governments. Not discerning any great effect on interstate commerce (i. e., no significant campaign contributions), the United States Congress has stayed out of this field. Many economists and politicians, especially those with a libertarian bent, wonder why a manicurist or a hair braider, needs a license. Restrictions on entry into an occupation protect the license holders from competition and allow them to raise their prices. I have read that at the peak 17% of the United States labor force was in trade unions. Now, about the same percentage has occupational or professional licenses, while trade unions have lost their clout and amount to 3% of the labor force. My guess is that those who hold occupational licenses are more likely to vote Republican, while trade union members once gave great power to the Democratic Party. My radical proposal is therefore for the federal government to preempt as much occupational licensing as is possible. That’s right, these functions would be taken away from the state and local governments. Unfortunately, I don’t expect the federal bureaucracy to usher in the reign of Milton Friedman’s Chicago School economics. But the federal regulatory process would likely pay less heed to local special interests, and it would produce a more homogenized and less idiosyncratic body of regulatory law more geared toward the most important cases, such as medicine and child care. The federal government is less likely than many state and local governments to obsess over licensing rules for fortune tellers, florists and athletic trainers. Though the Commerce Clause was stretched pretty far by the Warren Court in the 1960s, I doubt that the current Supreme Court would allow Congress to regulate dog walkers and hair braiders. Keep in mind that the alternative to my suggestion is not the status quo but rather a regime where occupational licensing becomes progressively worse at multiple levels of government. The defense of liberty requires changes, and sometimes that means recognizing that small, local governments are infringing upon our rights rather than protecting them. Posted in economic development, Missouri economy, Ozarks economy and tagged dog walkers, hair braiders, Tyler Cowen. Bookmark the permalink. A regulated industry sometimes is able to use a regulatory agency to restrict competition. In Missouri, licenses for dealers of new cars have been issued only to applicants which hold franchises granted by manufacturers, with the franchisees each maintaining a place of business within the state. The value of a dealership is strengthened if a manufacturer cannot open a competing dealership. Under Tesla’s business model, purchasers buy directly from the manufacturer, not from a separate dealership. Tesla granted itself a franchise and was thus both franchisee and franchisor, sparing customers the cost of supporting a separate dealership. The Missouri Automobile Dealers Association (MADA) sued the Missouri Department of Revenue and Tesla Motors, claiming that issuing the license to Tesla created “a non-level playing field.” The Cole County Circuit Court determined that MADA had a right to challenge the issuance of the license to Tesla and agreed with MADA that the issuance of the license to Tesla was unlawful. The Missouri Court of Appeals reversed the Circuit Court, holding that MADA (as well as another car dealer and a motor vehicle manufacturer) had no right to challenge the issuance of the license to Tesla, lacking standing. The appellate court examined the motor vehicle licensing statutes and found that the statutes permitted an applicant to challenge the refusal of the Department of Revenue to issue a license, but said nothing about the right of a dealer to challenge the issuance of a license to a potential competitor. Moreover, a court could not order the Department of Revenue to revoke the license, because the Department’s power to do so depended upon the existence of specified acts or events that were deemed by the Department’s director to be a “clear and present danger to the public welfare.” The director had not made such a discretionary finding. The appellate court characterized the MADA challenge as that of “competitors seeking to avoid competition and not as vindicators of the a larger public interest.” Thus Missouri follows several other states that have allowed Tesla’s business model to disrupt old ways of doing business. Uber and Lyft, Airbnb and HomeAway, and Zillow are similarly changing the economy, taking advantage of internet and smartphone technology to be responsive to consumer preferences. Lobbyists will have plenty to do. Posted in economic development, Missouri economy, Missouri law. Bookmark the permalink. 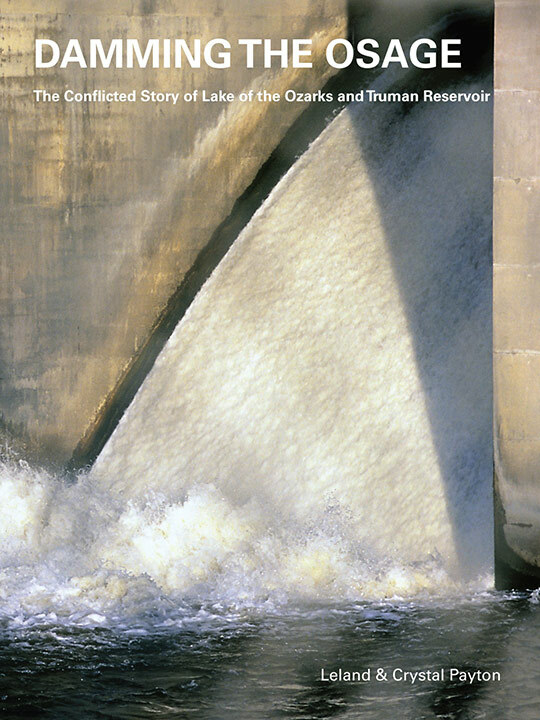 Damming the Osage: The Conflicted Story of Lake of the Ozarks and Truman Reservoir by Leland and Crystal Payton. Published by Lens & Pen Press, 4067 Franklin, Springfield MO 65807, $25 postpaid. Leland and Crystal Payton, prolific authors of books with lots of photographs about the history and culture of the Ozarks and about American culture generally, have tackled the history of human use and transformation of the Osage River. Their focus is on the political and financial machinations which resulted in the construction of Bagnell Dam and Truman Dam and their impoundments in the along the northwestern boundary of the Missouri Ozarks. Their original photographs and reproductions of graphics from newspapers, maps, magazines and advertising materials, provide a collage of images of the area before and after its transformation, as well as the images created by promoters of how it might look. The book covers the history of the residents of Osage basin, from prehistory to the present. From its origin in eastern Kansas to Bonnots Mill, the Osage flows through prairies along the northern Ozarks border into the Missouri River, at a point seven miles east of Jefferson City. Many and diverse primary sources, such as the writings of explorers and newspaper accounts, as well as the work of archaeologists, historians and other social scientists, make the book a rich trove. The theme of book is consistent with my own take on the history of the development of North America over the past five centuries, which is that development has been driven by the opportunities created by government investment for private investors seeking wealth through the subdivision of real estate and exploitation of natural resources. George Washington was a land surveyor, as was Thomas Jefferson’s father Peter. The Washingtons, the Jeffersons and other promoters–working hand in hand with the government–used every public and private resource they could muster to carve up the Appalachian frontier and beyond into reservations, territories and states for private and public gain. Eventually, the whole country became subdivided. In the case of the valley of the Osage River, the land was divided into lake lots and condo units and multi-purpose reservoirs. The Paytons identify Ralph Street, an “obscure Kansas City lawyer,” and Walter Craven, a mortgage banker also from Kansas City, as the fathers of Lake of the Ozarks. 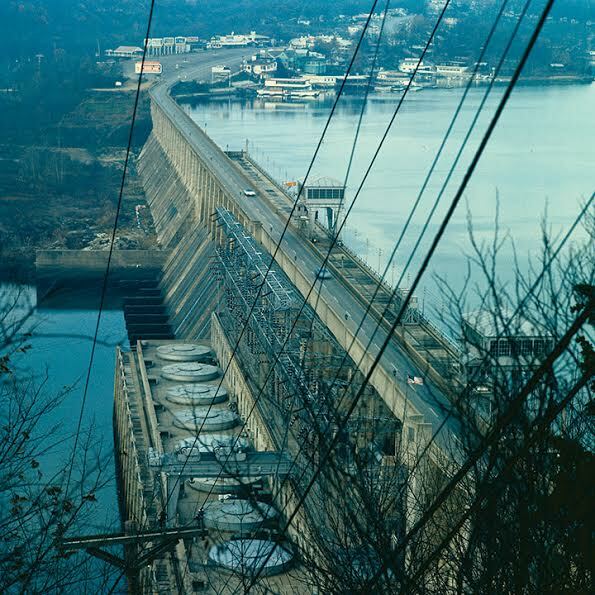 Street and Craven wangled a construction permit from the Federal Power Commission for the Bagnell Dam in 1924 and began acquiring options to buy land. The FPC and the Missouri Public Service Commission awarded permanent licenses for the project in 1926 to Craven, who transferred the licenses to Union Electric in 1929, after Craven failed to obtain construction financing. 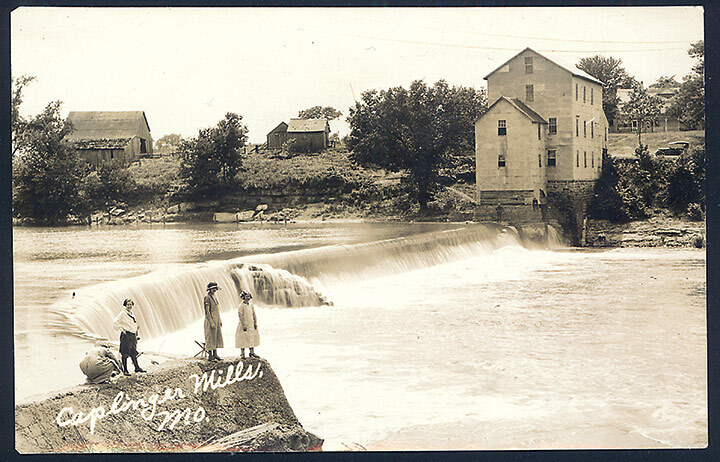 Unlike other popular accounts of dam-building in the Ozarks, the Paytons pay careful attention to what existed at various times before the construction destroyed towns (Linn Creek) and roads that connected towns, cutting off neighbors from one another. The occupation by Osage Indians is described, as well as the vain attempts to modify the river to enhance navigation in the steamboat era. Later, the valley was the pathway of railroads, many of them unsuccessful. Some sites, such a Monegaw Springs in St. Clair County and Ha Ha Tonka in Camden County, were beautiful places that captured the dreams of real estate salesmen and promoters of tourism. Once Bagnell Dam was completed in 1931, a particular flavor of tourist development was created around Lake of the Ozarks, remnants of which may be seen along the old parts of Missouri Highway 7 and US Highway 54 that have been bypassed by newer roads. The Paytons give us color and black-and-white reproductions of tourist pottery, wood carvings, fieldstone cabins, and garish billboards, as well as the intense condo development that came in the past two decades. Though the Corps of Engineers had opposed the construction of dams, including Bagnell Dam, by private companies, the Corps did not have a clear legislative mandate to build dams for flood control, hydropower, and irrigation, though it had always been engaged in construction and maintenance of levees and drainage of wetlands. In 1926, Congress asked the Corps to study 180 rivers and their tributaries to examine the feasibility of federal construction of reservoirs. The Corps’ report on the Osage basin, delivered in 1933, proposed dams on Pomme de Terre, the Osage River above Osceola, and the Grand River just north of its confluence with the Osage. In 1944, FDR approved the Pick-Sloan Plan for development of the Missouri River basin, and the dams on the upper Osage were among the 107 dams authorized. Pointing out that “Civic organizations in Warsaw, Clinton and Osceola were convinced that a dam, any dam, anywhere on the Osage would guarantee prosperity,” the Paytons designate Haysler A. Poague, a judge in Clinton, as the “stepfather” of the Truman Dam. Poague became an advocate of one large dam at Kaysinger Bluff near Warsaw, rather than the two smaller dams proposed by the Corps in 1933. A massive flood in 1951 convinced Congress and the public that spending money to put people to work and to control and store water was worth doing; the Paytons do not point out that the most severe drought in recorded history followed the 1951 flooding, which surely added to the public support for a water project. However, funding of the project was delayed other priorities—the Vietnam War and the War on Poverty, according to the Paytons—but the land acquisition and construction began in the mid-1960s. In 1972, just as work was beginning on the dam, the Environmental Defense Fund, the Missouri chapter of the Wildlife Society, and several other organizations and citizens, including Leland Payton, filed suit in federal court seeking to stop the construction of the project. The National Environmental Policy Act of 1969 (NEPA) required federally funded projects to be preceded by meaningful environmental impact statements, giving environmentalists a tool to challenge the adequacy of the investigation of ecological impacts of projects. In the case of the Truman Dam, the opponents were concerned about the fate of the paddlefish, among other issues, and could also point out that the cost-benefit analysis provided by the Corps strained to show net economic benefits. The final third of Damming the Osage depicts the political and legal wrangling over whether Truman Dam and its impoundment would be completed. Missouri’s congressional delegation led by Senator Stuart Symington, members of the state legislature, and virtually all local officials, as well as chambers of commerce, supported the project, even though biologists and many farmers opposed it. While the town of Clinton seems to have held its own, most of the Truman Lake area has continued to decline. Missourians have had to cope with the negatives. The Missouri Department of Conservation learned to raise paddlefish in hatcheries, so that they would not be extirpated in the Osage basin. Engineering oversights resulted in fish kills below Truman Dam and massive erosion below Stockton Dam on the Sac River, a major tributary of the Osage, which required additional land acquisition and bank stabilization. During the same era, the Corps of Engineers’ will and ability to marshal support for dam projects seems to have ended. The Endangered Species Act of 1973 provided environmentalists with stronger arguments. After tremendous fights, Congress deauthorized dam projects on the Meramec River in Missouri and the Buffalo River in Arkansas, as elected officials listened to a broader swath of their constituents and began to question the wisdom of destroying the last few free-flowing rivers. The Paytons have captured the spirit of the times the book covered. The text is thorough and the images are vivid. While Leland Payton was clearly opposed to the construction of Truman Dam, the positions of the proponents are fairly explained. Damming the Osage is an essential chronicle of how dams and reservoirs gain momentum and get built, even though they make sense perhaps for only a minority. Posted in Missouri economy, Ozarks arts and culture, Ozarks economy, tourism, water law (streams, lakes and groundwater) and tagged Bagnell Dam, Lake Ozark, Missouri, Osage River, Ozarks, Truman Reservoir. Bookmark the permalink.